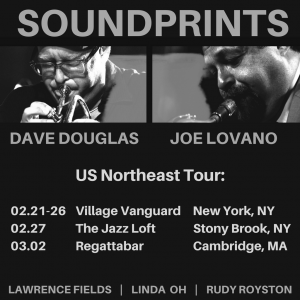 Soundprints, the quintet led be Dave Douglas and Joe Lovano, is playing some dates in the US Northeast, including New York, Stony Brook and Cambridge. They’ll be playing some brand new music and some repertoire from their debut album Live at Monterey Jazz Festival. The band will include pianist Lawrence Fields, bassist Linda Oh and drummer Rudy Royston. Look for a new album from this group in the near future. See you out there!